iSwinging by InJoyee Co,. 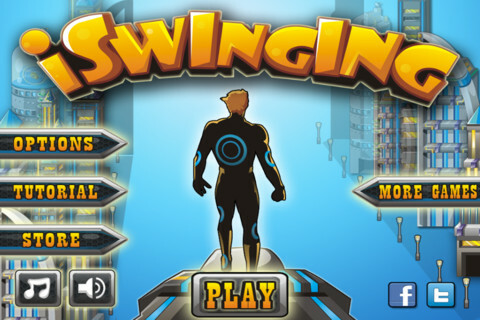 Ltd.
iSwinging is a spider-man-like swinging game, challenges players to swing through buildings with the use of strings and momentum, and it is free available for iPhone, iPad and iPod Touch entertainment. Wondering in the city like Spiderman is a dream shared by generations and now it is no problem for any player in this game. 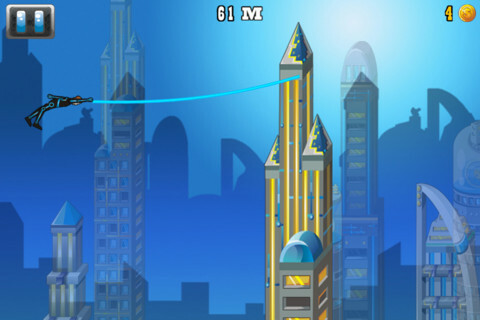 Live that fantasy by taking advantage of the rope and swinging from one building to another; collect coins alone the way to purchase and upgrade props to achieve better distance; and be aware the satellites and flying saucers because you can get great help from them. * Multiple characters and different ropes are available. * Ever changing daytime, from day to night. * Different props to purchase, collect, and upgrade. Tags: InJoyee Co., iSwinging, Ltd.